Please be assured that we package each item carefully without causing damage. Company name Roland Brand name Roland Product Code US-20 Size 10.2108x32.004x26.0096 Weight 1700 Item Description1 Unit selector. Thank you for your seeing my page. Please feel free to question if there is an uncertain point on this page. International Buyers - Please Note. These charges are the buyers responsibility. We do not mark merchandise values below value or mark items as gifts - US and International government regulations prohibit such behavior. 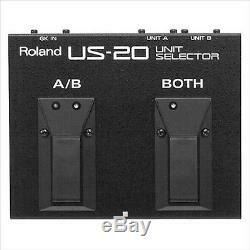 The item "New ROLAND US-20 Unit Selector From Japan Japan NEW" is in sale since Thursday, August 23, 2018. This item is in the category "Musical Instruments & Gear\Guitars & Basses\Parts & Accessories\Effects Pedals\Other Guitar Effects Pedals".t" and is located in Ishikawa. This item can be shipped worldwide.